The sun is shining (thank goodness) but winter ain’t over yet! Yet another deep freeze this week and many of us are looking for comfort food. Here is a recipe I created for a cooking class I did at The Big Carrot last month and I think it fits the bill. 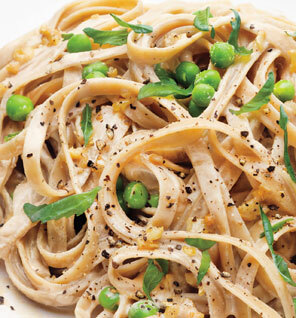 Its rich and creamy but clean at the same time – no bloating here! Once soaked and blended cashews are an amazing dairy alternative. Using gluten free pasta and adding some greens makes this a satisfying and well rounded meal you can indulge in guilt-free. Everyone in the class loved it, as did my gluten and dairy eating friends – success! For those of you sticking to a grain free diet this sauce is seriously amazing over a bowl of broccoli, peas, and roasted sweet potatoes. Soak cashews overnight in lukewarm water. If you’re in a rush soak in boiling water for 30 minutes. Finely chop onion and garlic and sauté in a little water until translucent and soft. Bring a pot of water to boil as onion and garlic are cooking. Add pasta and cook according to package (approx 10-12 minutes). Stack a colander on top to steam your vegetables. Drain cashews and toss in a blender with onion, garlic and all other ingredients. Blend until smooth and creamy. Taste and add more seasoning if desired. Drain pasta. Cover pasta and vegetables with sauce and toss. TIP: Got company? Serve with fettuccini noodles and top with crispy bacon bits! This entry was posted on February 26, 2014 by katelivingfull in Savoury Recipes and tagged anti inflammatory, comfort food, dairy free, gluten free, grain free, greens, vegetarian.